Issue Four in the "Air Combat Legend Series" - a rare classic by highly regarded artist, Nicolas Trudgian. One of the Luftwaffe’s great fighter leaders, Hannes Trautloft scored his first air victory in the Spanish Civil War in August 1936. Returning to Germany in1937 he joined the national aerobatics team flying the Me109.Soon after the outbreak of World War II, Hannes took command of 1./JG20 taking part in the Battle of Britain, before moving to the Balkens as Kommodore of JG54. Now leading the group on the Russian Front, JG54 took part in the heavy fighting, ekjeefirst in the Me109 then in the Fw190. In the summer of 1943 Hannes Trautloft joined General Galland’s staff. As a ‘mutineer he was sacked by Göering, thus ending an illustrious combat career comprising 550 combat missions and 57 victories. 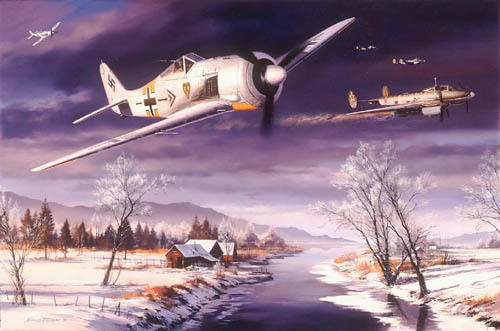 Nicolas Trudgian’s fine painting shows Trauloft’s Fw190 bringing down a Russian Petlyakov Pe-2 on the Eastern Front in 1943, set in a stunning Winter landscape. Overall Print Size 18" x 12"
Overall matt size: 25" x 19 1/4"